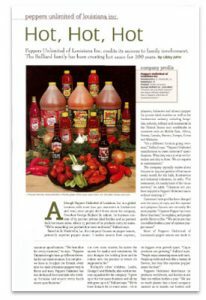 Pepper Press | Peppers Unlimited of Louisiana, Inc.
Peppers Unlimited of Louisiana, Inc., a sauce manufacturing company located in St.Martinville, Louisiana has been recognized by the State of Louisiana as a 2017 recipient of the prestigious Lantern Award. Lantern Award winners are selected by Louisiana’s eight Regional Planning and Development Districts, based on the contributions of the manufacturers to their communities, including investments in employment growth and facility expansion. Each business also must be in business at least three years prior to the nomination. Peppers Unlimited of Louisiana, Inc., one of the leading producers in the hot sauce industry, is proud to announce its Re-certification of Safe Quality Food (SQF) Level III with a second straight year of obtaining an “Excellent” rating. SQF Level III is a world recognized Quality and Safety certification program. The SQF certification program is one of the few such programs endorsed by the Global Food Safety Initiative (GFSI) for primary production as well as manufacturing, food storage and distribution, and agents/brokers. SQF Level III Certification achievement recognizes the considerable effort and investment in developing extensive food safety and quality management systems. 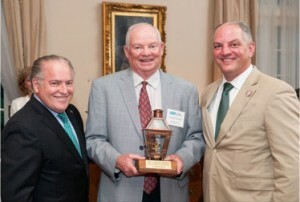 Vice-President, John Bulliard, stated, “This distinguished accomplishment assures Peppers Unlimited of Louisiana, Inc. products have been produced, prepared and handled according to the highest possible standards while providing independent certification in compliance with international, regulatory and other specified standards.” President, George Bulliard, stated, “We are proud of the efforts that our Quality Team has put forth from internal training to the most recent and highest Quality Standard that can be achieved. Peppers Unlimited of Louisiana, Inc. is also proud to be a frontrunner for the hot sauce industry in the achievement of this prestigious accreditation so that our valued customers receive the quality and peace of mind they deserve from our products. Current Re-Certification dated September 2012 SQF Level III. Our original Certification dated August 2011 SQF Level III. St. Martinville, LA Peppers Unlimited of Louisiana, Inc., custom manufacturers of top quality retail, food service and industrial sauces for more than 1000 clients worldwide, today announced their latest achievement in excellence: SQF2 Level III Certificate – Peppers Unlimited of Louisiana exp Aug 2012 by Silliker Global Certiﬁcation Services. Recognized as the worldʼs leading food safety and quality management system, Peppers Unlimited is the ﬁrst hot sauce manufacturer to receive certiﬁcation. “Peppers Unlimitedʼs Excellent rating demonstrates our unparalleled commitment to food safety and reﬂects our longstanding dedication to food quality and security,” said company vice president John Bulliard. The companyʼs state-of-the-art facility boasts the capacity to produce more than 100,000 gallons of bulk sauce a day. Blending and customization is handled by an elite in-house team of food scientists and technicians led by Bulliard, and every batch is sampled for consistency. The companyʼs bottling lines are designed and built on premise by Bulliard. They are modiﬁed as needed and modernized yearly. Committed to quality and attention to detail, Peppers Unlimited produces everything except the bottle, cap and label. 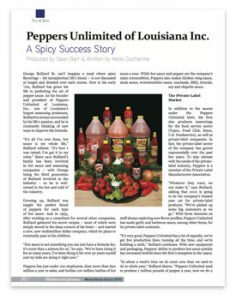 Although Peppers Unlimited of Louisiana, Inc. is a global business with more than 500 customers in foodservice and retail, most people don’t know about the company, President George Bulliard Sr. admits. Its business consists of 65 percent private label bottles and 20 percent bulk hot sauce sales. About 15 percent of its products carry its name. “We’re expanding our product line more and more,” Bulliard says. George Bulliard Sr. can’t imagine a meal where spicy flavorings – his metaphorical life’s blood — is not discussed at length and drizzled over each course. Now in his early ’70s, Bulliard has given his life to perfecting the art of pepper sauce. 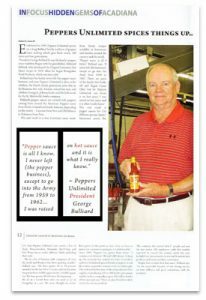 As the founder and president of Peppers Unlimited of Louisiana, Inc., one of Louisiana’s largest seasoning producers, Bulliard is always surrounded by his life’s passion, and he is constantly thinking of new ways to improve the formula. Established in 1993, Peppers Unlimited carries on a long Bulliard family tradition of pepper sauce making which goes back nearly 100 years and 4 generations. … The end result is a true Louisiana sauce made from family recipes available to businesses and families around the country and around the world. … ‘People have to have their hot sauce,’ Bulliard says. ‘We’re successful because of our strong service, on-time delivery and great consistency with the products … We never thought we would have grown to the point we have today, we have so many new customers coming in, it is unbelievable.